Lead Center – transfer information gathered about potential clients to QuickBooks and customize what data you want to display; if the lead eventually turns into a customer, with one click that person or organization will appear in your customer section and all information will be automatically transferred. QuickBooks polls its users and prepares industry reports based on that information; you will now have access to those reports for a better gauge on how your business is performing and how the industry is doing as a whole. Donation statements – prepare end-of-the-year donation report to see who the biggest donors are and what percentage of donations each of them represent; for your own analysis, you can run those reports for any particular time frame. Prepare Form 990 – this Statement of Functional Expenses will summarize your organization’s activities, revenues, and expenses and will be ready to include for your reporting to the IRS. Prepare financial reports for the Board of Directors – show accountability with this professional report that breaks down income and expense categories you created. Report donor contributions – breakdown of contributions by donor with details of when, how, and how much. Prepare Non-Profit chart of accounts – start the operations right away with the most common chart of accounts for nonprofits; new accounts can be added as you go depending on the nature of the business. Manage budgets and finances by program – comprehensive report that analyzes each program your organization has established; each expense category is compared to the budget and current amounts are expressed in dollar and percentage of the budget; the report can be prepared for different time periods. Manage balance sheet by class – this gives you flexibility to see balance sheet of each program you have created and compare them directly. 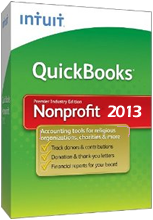 We are looking forward to using quickbooks with our organization.